Power banks are an essential if you use a laptop or Macbook on the move and away from mains power for any length of time. If you are on the road but rely heavily on modern technology, then it’s important to ensure your laptop remains charged. The problem is that so many modern laptops burn a lot of power, so if it’s not feasible to simply plug them into a nearby mains outlet, it’s important to have a charging option that is portable, such as a power bank. Power banks store electrical energy so that users can plug their laptops or mobile devices in when they need a recharge. Modern power banks are compact and easy to carry, with some being as small as a mobile phone! Power banks can charge everything from smartphones to laptops and Macbooks, simply by plugging into them whenever power is required. The Intocircuit 26000mAh Power Bank Charger has a huge capacity and will charge most laptops 3times or over 10 full charges to iPhone, or 2-3 full charges for an iPad. This device comes with 10 laptop connectors and adaptors so can be used for most laptops and smartphones. The Zendure 2nd Gen A8 Pro Portable Charger also has an extremely high 25600mAh capacity with 4 USB charging ports rated at 3.1A. Each port automatically detects your device and fine tunes the output so it will charge it at maximum safe speed. 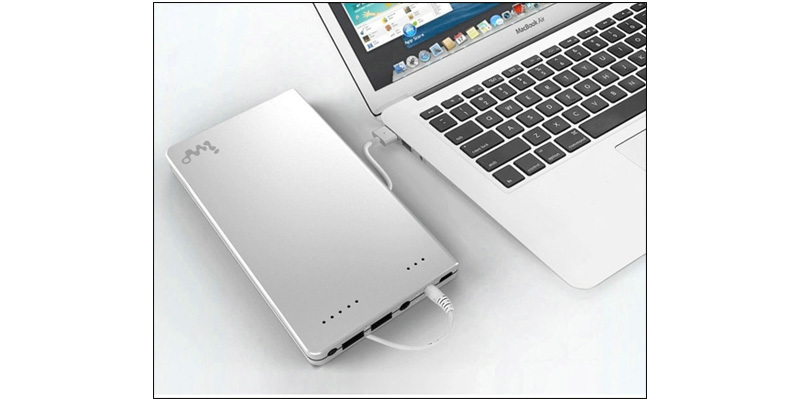 The ChargeTech 27,000mAh Portable Battery Pack is a power bank specially designed with power hungry MacBooks in mind. All USB ports are equipped with FastCharge technology and are rated at 2.4 amps for rapid charging and this device uses the highest quality Panasonic and Sanyo lithium-ion battery cells.